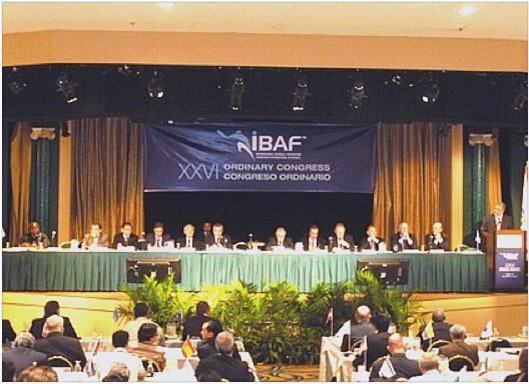 Dallas (Texas-USA) - The XXVI Congress of the IBAF opened with the presentation of some awards in recognition to the support offered to the organization during the last 2 years. The IBAF is very thankful to Paul Archey, MLB Vice President International Business Operations. “The United States have not hosted a Congress in more than 30 years. We fully support the IBAF and not only I appreciate him professionally, but I like to call Riccardo Fraccari a personal friend. As MLB, we will do whatever we can to support the Olympic reinstatement campaign”. An award goes for their support to Nippon Professional Baseball (represented by Secretary General Kunio Shimoda), the Korea Baseball Organization (represented by Deputy Secretary Yang Hae Young), the Chinese Professional League (represented by Commissioner Chao Shou Po). Chao Shou Po offered his full support to the Olympic reinstatement program: “There is no reason why baseball should be out of the Olympic Games." The Congress also welcomed the presence of the Babe Ruth League and Little League Baseball. President Fraccari introduced and thanked Don Porter, the President of the International Softball Federation (ISF), for sharing the vision of Olympic Reinstatement and the need of a joint bid. Porter confirmed: “Our Congress in Oklahoma City voted a resolution to support the work we have already began doing together to regain Olympic status for both our sports”. Porter remembered the huge effort done by former President Bob Smith in the 1980s and said he is confident baseball and softball have a good chance “If they work together”. Porter continued: “There are millions of boys and girls throughout a world that do not have a dream. We want to provide them one”. As the representative of the IBAF, Justine Siegal attended the IOC's 5th International Athletes' Forum in Colorado Springs (USA. "I introduced myself and stated" said Siegal "Girls and boys, men and women, play and love baseball around the world. And we great passion we want to be back in the Olympics"
The Congress unanimously approved a joint bid with softball and delegated the Executive to sign an agreement with the International Softball Federation.